https://matcha-jp.com/en/3058 Oki Islands - Stunning Nature At A UNESCO Global Geopark! In this article, we feature Dogo Island, where you can view breathtaking scenery at the UNESCO Global Geopark-designated Oki Islands in Shimane Prefecture. On Dogo Island, visitors are able to enjoy the sunlight and vibrant blue ocean water. Located in the northeastern Japanese sea in Shimane Prefecture are the Oki Islands. The Oki Islands comprise of four inhabited islands and several uninhabited islands. With a unique ecosystem and terrain that reveals the geographical history of the Japanese archipelago, the Oki Islands were certified as a UNESCO Global Geopark in 2015. Dogo Island is biggest of the Oki Islands and is a spot where you can enjoy nature along with the unique cultural environment stemming from the island's rich history. In this article, we will be introducing to you the best spots on Dogo Island to take in the magnificent outdoors. Towering above the vast ocean northwest of Dogo Island is a massive and unusually shaped rock known as Candle Island. It stands approximately 20 meters tall with a sharp tip that resembles a candle. Candle Island is viewable from the observatory. However, the magnificent sight of the overlapping island and sunset is best experienced during a ride on the sightseeing cruise here. The sightseeing cruise runs from April to October and reservations can be made at the Okinoshima Town Tourism Association. In the event of poor weather, operation of the sightseeing cruise will be canceled. We recommend asking for more information via phone as a precaution. As the sightseeing cruise sails towards Candle Island, the sun gradually sets. 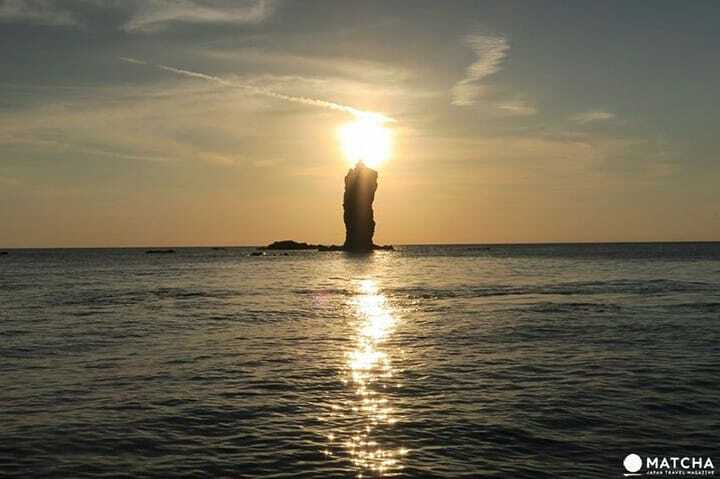 Not long after, you will see a phenomenal combination of the rock and the setting sun, with the sun eventually meeting the tip of the island, resembling a gigantic lighted candle. The view is breathtaking. Designated as a National Natural Monument, Shirashima Coast is located on the northernmost part of Dogo Island. Here visitors will find a variety of high and low rock walls four kilometers long. Scattered around the cliff are islands. This beautiful and unique scenery is the result of long years of sea erosion and weathering. At Cape Nagu, visitors will find a historical lighthouse. Before electricity was invented, the lantern at the lighthouse remaining currently was lit with fire to inform ships and boats of the location of the cape. The observatory offers panoramic view of Oki Islands' Dozen Islands. Here visitors can get a clear and exquisite glimspe of the Sea of Japan. Designated as a national park, the Jodogaura Coast is made of several small islands. The contrast between the reef and pine trees has an other-worldly appearance. During summer you can enjoy sea kayaking and diving here. There are many harbors and observatories on the west side of the Sea of Japan. They make the perfect spots to relish the magnificent sight of the bold red sun setting on a clear day. To the northwestern part of Oki Islands is the Kumi district, where you can find the Candle Island Walking Trail. By strolling on this trail, visitors can take in the sun setting and Candle Island at the same time. Oki Islands are surrounded with beautiful nature and ocean. There are a number of marine sports activities you can try as well, from diving to kayaking, allowing visitors to fully enjoy their time on the islands. By going out into the sea, you can get a close-up look at the clarity and vibrancy of the sea water. Vistiros can also admire the rare hues of the different geological formations of cross-sections and caves during sea kayaking. Take a Trip to the Oki Islands! The Oki Islands offer a lot of picturesque scenery. The abundant nature found on Dogo Island is truly the gem of the Oki Islands. You are bound to experience a unique side of the great outdoors no matter where you go! The Oki Islands are a little-known spot in Japan and is rarely crowded. Be sure to visit and discover the array of hidden picturesque scenery.